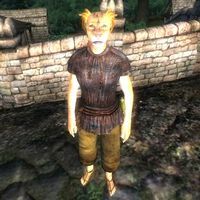 Tsalajma is a Khajiit commoner residing in the village of Border Watch. Similarly to her fellow townsfolk, Tsalajma believes in the prophecy of K'sharra, which foretold that a warning of the end of the world would come through three signs, which would appear in Border Watch. She keeps her hopes up, however, and lives a relaxed and peaceful existence in town. She gets up early at 4am to wander around town all day long, at times conversing with her neighbors. At 7pm she will head towards the Border Watch Inn, where she will eat a two-hour dinner in the company of most of the other inhabitants of the village. At 10pm she will head back home and sleep until the morning. The only exception to this schedule is when the prophecy seems to have fulfilled itself; when she will run around in wild panic, believing the end is near. After the related quest is over, she will return to her daily routine, albeit not entirely sure of the future. Her wardrobe is of a lower-class standard, consisting of a sack cloth shirt, pants, and sandals. She also possesses two leveled set of spare clothing and has a 25% chance each of possessing five pieces (a full set but for the cuirass) of leveled light armor, which she will equip the moment the three signs become reality. In combat, she wields a leveled one-handed blunt weapon, which may be enchanted at higher levels. She also carries a small amount of gold. She isn't very talkative, but is willing to guide you to the town's Shaman, Ri'Bassa, once you have started the related quest. Esta página foi modificada pela última vez à(s) 01h04min de 26 de abril de 2013.